To say Spain played Russia in the quarter finals of the world cup to a draw was technically true. But in reality Spain played and Russia chased for most of the match inside the cavernous Luzhniki Stadium, the former content to keep possession of the ball after an early goal and the latter, well, content to let them have it. For 10, 15, 20 passes at a stretch, Spain worked the ball around the field at will a game of keep away disguised as a World Cup elimination match. 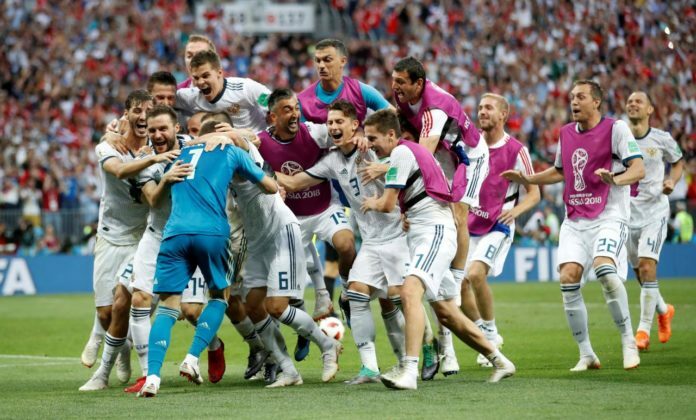 The pro-Russian crowd whistled its disapproval early and repeatedly, and urged its team on with all its might whenever it managed even briefly to steal the ball away from the Spaniards. But Spain, inevitably and repeatedly, simply took it back. And kept it. 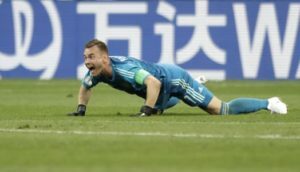 Spain was so dominant in the first half that it nearly made it to halftime with a one-goal lead despite taking no shots: its opening goal came off the right ankle of Ignashevich, who unwittingly scored the World Cup’s 10th own goal — a record that continues to grow — as he fell to the ground while tangling with Sergio Ramos on a free kick in the 12th minute. Staked to the early lead it needed, and with Russia packed in ahead of a five-man back line, the game quickly devolved into a training session. Spain passed. Russia chased. Nothing happened. And then, in the 40th minute, suddenly everything changed. Russia won a corner, Alexander Samedov fired it in and Dzyuba headed it directly onto the arm of Spain’s Gerard Piqué — who for some reason had jumped to challenge him with his back turned and one arm over his head. Russia had ridden that kind of full-throated support right through its first three games at the World Cup. Its maximum effort and early success at the World Cup quickly got its countrymen on board, easing fears that the tournament might be ignored by the host country. After its second victory, against Egypt, Russians poured into the streets of central Moscow, honking car horns, waving flags and celebrating until well after midnight. Dzyuba’s goal seemed to revive them, and let them think victory might just be possible. The start of the second half was more even, and the free kicks Russia won — with increasing frequency — soon began to create two and three half-chances before Spain got the ball clear. 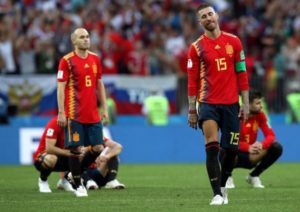 Spain still ruled the statistics — it completed 1,029 passes to Russia’s 202 — but it stubbornly refused to adjust its style even after it became clear Russia would not yield. It had good chances — a long-range shot by Andres Iniesta in the second half, a dangerous run by the substitute Rodrigo in the second extra period — but the goal never came. Akinfeev did the rest, stopping Koke on Spain’s third attempt and Aspas on the fifth. As he kicked the ball high into the air with his trailing foot to seal the victory, the crowd of 78,011 made a sound louder than any at this World Cup.